An admitted aspiring terrorist from Long Island told authorities he met with other people locally to discuss going overseas to kill Americans, court documents show, although the teenage suspect is the only person charged so far in the investigation. Justin Kaliebe, 18, of Babylon, said he met with others in Suffolk County to talk about helping al-Qaida terrorists in Yemen. “I and others discussed different ways we could support such a group, such as providing money, equipment and ourselves,” Kaliebe said in a Feb. 8 guilty plea hearing that had been sealed until this week. U.S. District Judge Arthur Spatt released a partial transcript of the hearing Wednesday afternoon after NBC 4 New York requested additional court documents in the terror case. An 18-year-old Long Island high school student inspired by Osama bin Laden tried to travel to Yemen and join al-Qaida operatives in waging “violent jihad,” federal authorities said Wednesday. Jonathan Dienst reports. Several key sections of the transcript were blacked out as the judge cited ongoing national security considerations. It is unclear if others who may have met with Kaliebe are still on Long Island or overseas. Kaliebe was arrested at Kennedy Airport in January on material support for terror charges. The FBI said he was caught on tape by undercover agents talking about his plan to kill U.S. soldiers overseas. During the once-secret hearing, Kaliebe spoke of how he hoped to provide help to al-Qaida terrorists. Kaliebe’s arrest was shocking in part because the high school senior lived with his family in a $2 million dollar home. “I was in 12th grade at the time of my arrest,” Kaliebe said, adding he did not suffer from any mental illnesses. The only drug he was taking was a testosterone supplement, AndroGel, he told the court. 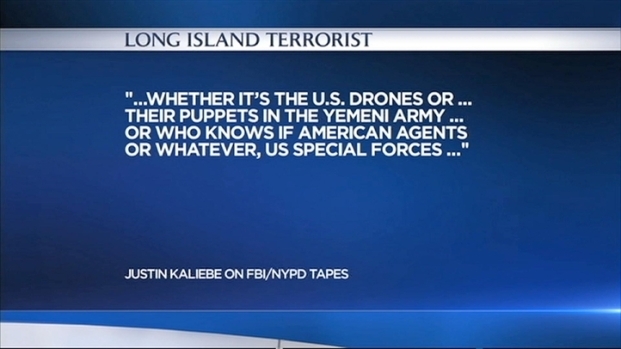 News of Kaliebe’s arrest was kept secret for months as federal agents and the NYPD continued the investigation. Under his plea deal, prosecutors said he faces up to 15 years in prison on each of the two terror counts.